Richie Mishal, World's Best Nutritionist. | Giving professional fitness advice for over 10 years! Respected author Robert JR Graham, writer of the Seventh Journey recently sat down with me for in interview about my article “The Drug Pushers vs. Vitamin Supplements” and my all new fitness program the 3 pillars of health and nutrition. The article is posted in it’s entirety below. My name is Richie Mishal. I am a nutritionist and a health writer with double major in nutrition science and anthropology. My qualifications include more than 20 years of experience in health, nutrition and bodybuilding. My education experience and knowledge gives me a unique perspective on bodybuilding, health and nutrition, a perspective which will help you in your fitness endeavors. Your article “The Drug Pushers vs. Vitamin Supplements” strikes a chord with me. I also believe in the value of vitamins, how have they affected your life? Vitamins have affected every aspect of my life, how l feel, function, even my success and achievements. As l grow older, my lifestyle choices have more impact. What l took in stride in my twenties affects me differently now. A constellation of factors…stress, poor dietary habits, environmental factors and activity level, all have profound effects. I am always in control of my body and l will never allow myself to be victimized by poor nutritional status. Vitamins have greatly improved my own health, helping me lose weight and dramatically reverse a dangerous course towards high Cholesterol. So my advice to your readers is to catch your symptoms now, safeguard your bones, heart and health for the future. There are many powerful documentaries now bringing these ideas to light, such as Food Inc., or Fat Sick and Nearly Dead, with tremendously positive impacts. Do you think Big Pharma‘s agenda is to down play the effectiveness of vitamins? Of course, physicians are generally not taught very much about nutrition and health in medical school. After school, the drug companies take over physicians ongoing education, and these drug companies promote their patented high profits products, not inexpensive nutrition supplements. They spend billion of dollars in advertising to physicians and consumers, and they also influence how many so called scientific studies are conducted and published. It’s unfortunate, but I agree with your opinion on the education in our medical systems. With Hippocrates himself being quoted as saying “Let Thy Food Be Thy Medicine.” how did we end up removing the topics of food and nutrition from our medical schools? Doctors are taught about pharmaceutical and surgical solutions. Perhaps it is no coincidence that roughly 20 percent of medical schools yearly budgets comes from the drug industry. The impression these doctors get during medical school is that if isn’t being taught, it must be not important. But they are taught vitamins deficiencies can cause diseases and let’s not forget that the doctor who prescribes vitamins to his or her patients is viewed by their counterparts as a “quack”. What l don’t comprehend is we don’t teach nutrition to doctors and we do not offer it to most of the sick, yet we provide a nutritionist to every patient in the hospital. Lastly, l’ll say to all your readers that try to have access to a nutritionist at first sign of a health problem to keep their bodies from breaking or getting sick. You’re also the inventor of a revolutionary program called “The Three Pillars of Health & Nutrition,” what’s this about and what can this system do for people? I developed “the three pillars of health and nutrition” program to help people achieve their ultimate fitness goals. Whether you want to gain muscles, lose weights, or live a healthy long life, you must adhere to three essential factors “pillars” 1) Diet. 2) Exercise. 3) Nutrition Supplements. This program is about give people a good understanding on how to eat right, train hard, and take a variety of sports nutrients to ensure their progress. If you disregard any of these pillars your achievement will be slow or will never achieve your ultimate fitness goal. Some people don’t take supplements and that’s wrong because nutrition supplements can increase your strength and muscle size, enhance, and keep your immune system strong, making them essential tools in your training regimen. I’m glad you’re taking a positive stance on the topic of “excess vitamins.” Do you think there’s any real harm in higher doses? I’ve even heard this can heal a wide range of problems, ranging from depression to even cancer. What are your thoughts on this? Vitamins are extraordinary safe. There are only two vitamins, vitamin A and D that pose some risk in very high doses because the body stores them. However, it’s unlikely that most people will overdose on them. The more common problem is that people don’t get enough of them. We must bear in mind that your body will never absorb 100 percent of the vitamins you consume. If it did, you’d never have to go to the bathroom. you actually absorb a relatively small portion of what you take. So l always say, it’s important to follow the usage directions on bottles of these vitamins. Thanks for interviewing Richie. Where can we find more of your health articles and opinions? Yes, you can find more of my health articles and opinions on my blog at, richiemishal.wordpress.com. Thank you so much for interviewing me on your respected magazine! I’ve read your vitamin article. 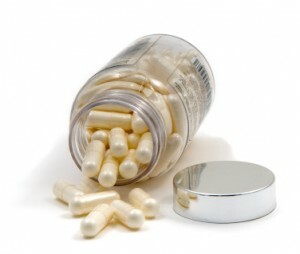 You mentioned that vitamins are critical to your overall body and in some cases can replace drugs. My doctor dismissed the use of vitamins and he would only prescribe drugs to me, not vitamins? Can you elaborate on that please? Thank you sir. Oh Phyllis you’re going to get me going here. First, thank you for reading my articles. As a nutritionist and health writer, as well as someone who has developed and created a revolutionary program “The Three Pillars of Health & Nutrition,” I have spent nearly all my adult life delving into nutrition and health. I believe the evidence supporting the benefits of vitamins, minerals, and herbs is overwhelming and persuasive. Also on a personal level, l lived it with my beloved Palestinian mother and saw how nutrition supplements had greatly improved her health, helping her lose weight and dramatically reversing a dangerous course toward hypertension and diabetes. 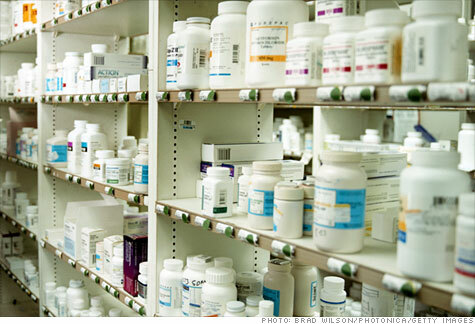 Big Pharma’s Medications — A cover up not a solution. As I mentioned previously, drugs are nothing but low doses of poisons with side effects that often outweigh their benefits. Drugs are “foreign” substances to the body’s normal biochemical process. They only mask the symptoms of diseases while failing to treat the causes. In contrast, vitamins, minerals, and the nutritional substances in herbs are substances normally found in the body. They foster the myriad normal biochemical process that literally does everything, such as burn food for energy, beat your heart, enable your eyes to see, fight infections, further thinking process, and much more. I have heard many physicians and their patients speak of surprising “side benefits” after taking nutritional supplements, where more than the intended health problem is resolved. Doctors are not taught very much about nutrition and health in Medical school. Their classes emphasize anatomy, diagnosis, and medications, virtually nothing about diet and nutritional supplements. After Medical school, the drug companies take over physicians ongoing education, and these drug companies promote their patented high profit products, instead of inexpensive nutritional supplements. Each year, drug companies spend billions of dollars on advertising to doctors and consumers, as well as influencing the outcome of many scientific studies. Eat well with proper supplementation. Yes, vitamins are so important to your overall health and certainly can cure you. For years, doctors dismissed the value of vitamins, preferring to prescribe expensive drugs or to perform surgery. Now they’ve have to change their decisions on vitamins after so much scientific research confirmed the health benefits of vitamins, minerals, and other nutrients. Your body requires relatively small amount of these vitamins compared to protein and carbohydrate. Still, many people do not obtain enough vitamins, either because they don’t eat the right foods or because of absorption problems. Unfortunately some doctors still disagree with me on that, and some have said that excess vitamins lead only to expensive urine. To me , it’s irrational argument. Here’s why: If you drink an expensive bottle of wine, you’ll also have expensive urine. When you eat expensive prime steak, your body will use part of it and turn the rest into expensive stools. Should you then eat and drink the cheapest foods possible? Of course not, you should eat the most nutritious foods possible. Your body will never absorb 100 percent of the food or nutrients you consume. If it did, you’d never have to go to the bathroom. You actually absorb a relatively small portion of what you eat, and it’s no different with vitamins. When you take large doses of vitamins, your absorption becomes less efficient, but you’ll still absorb more overall than if you took a smaller amount. So, don’t pay attention to these doctors. My recommendation is to try to communicate with your doctor and work with him or her if you want to treat a specific disease and trust me l understand if you don’t do it, perhaps because it’s too hard to find a doctor who knows something about vitamins or because their insurance won’t reimburse for that type of care. As a consequence, many people have started treating themselves with vitamins, which isn’t really all that bad. If you need anymore advice on nutrition and vitamin supplementation please email me at richiemishal@yahoo.com. My advice is always free of charge because I know from first hand experience the amazing benefits of proper nutrition and it disturbs me that many people go through life believing their health problems are a normal part of life or aging. When people take vitamins for the first time, they often discover just how dramatic vitamins can improve health. Whether you’re young or old, male or female, work hard as an activist for Palestinians freedom and self determination or a desk job, vitamin supplements can often have an amazing effect on your health. Wishing you best of health Phyliss. Hi Richie, l found your blog through Dr. Sam Hassan. Anyway, l have read in Prevention Magazine about the storage of fat in the body. So my question is, can you explain to me the mechanism of fat accumulation and weight gain? Dr. Hassan is a great friend that I always take pride in his friendship. Tim, you know what? Everyone has fat. It’s crucial that you pay attention to what l am going to tell you about how can you control your body the easy way. When you understand the mechanism of fat accumulation and weight gain, you will be able to control your weight easily, without the restrictions and bodily harm caused by unbalanced diets. Your body will accumulate fat when the total energy factor assimilated from food consumption, exceeds the amount of energy expenditure in every day living. When food intake is high in carbohydrates, which are very readily available and absorbed from the intestinal tract, a rapid rise in the blood sugar will happen. Insulin is then released into the blood stream to assist in the utilization of the sugar consumed. If too much sugar is consumed for a long period of time, it’s possible you may get diabetes which is a very serious problems in which half of my relatives have. The glucose which is not used for energy will be converted and stored as glycogen by Mr. Liver. The glycogen is then stored in the muscles and the liver itself. When the body has need for energy, this substance is then converted to glucose. If there is an excess of glucose that the liver and muscles cannot handle, or will not store, it will be converted to fat, which then elevates the blood-fat level (Cholesterol-triglycerides) and eventually causes weight gain. Bear in mind that fats have more than twice as much energy potential “Calories” as protein and carbohydrates (affectionately referred to as carbs): 9 calories per fat gram versus 4 calories per gram for proteins and carbs. Some of the body fat made from food fat is visible. Even though your skin covers it, you can see the fat in the adipose (fatty) tissue in female breasts, hips, thighs, buttocks, and belly or male abdomen and shoulders. This visible body fat provides a source of stored energy, gives shape to your body, cushions your skin (imagine sitting in your chair for a while as you enjoy your visit to usadiamondnutrition.com without your buttocks to pillow your bones), and acts as an insulation blanket that reduces heat loss. Other body fat is invisible. You can’t see this body fat because it’s tucked away in and around your internal organs. 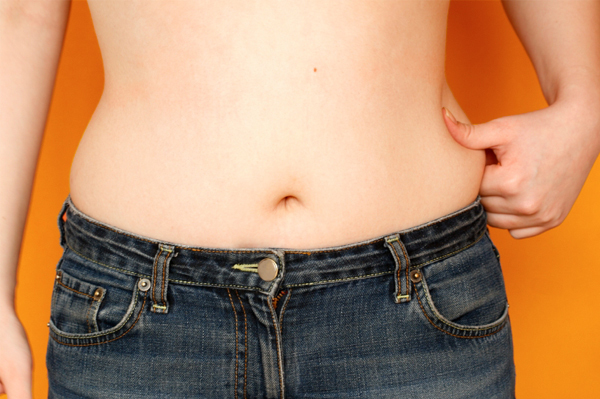 This hidden fat is part of every cell membrane (the outer skin that holds each cell together). A component of myelin, the fatty material that sheathes nerve cells and makes it possible for them to fire the electrical messages that enable you to think, see, speak, move, and perform the multitude of tasks natural to a living body; brain tissue is also is rich in fat. Invisible fat can also serve as a shock absorber that protects your organs (as much as possible) if you fall or are injured. 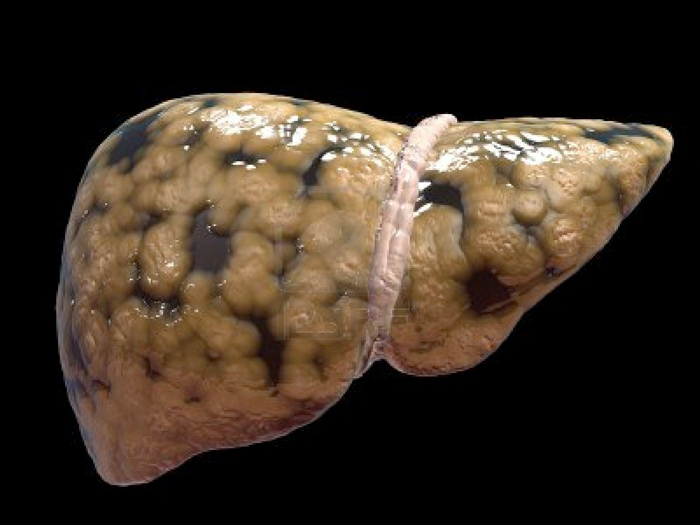 A liver showing hidden fat stores. What’s really makes me want to scream loudly “NO” are these nutritionists who say carbohydrates provide a protein spare action, in other word if you don’t eat carbohydrates, the body will convert your muscle tissue and other proteins into glucose in order to maintain the blood sugar level. This is true but only if you don’t have any fat on your body. I believe what has been ignored is that the body will first turn to the stored fat. 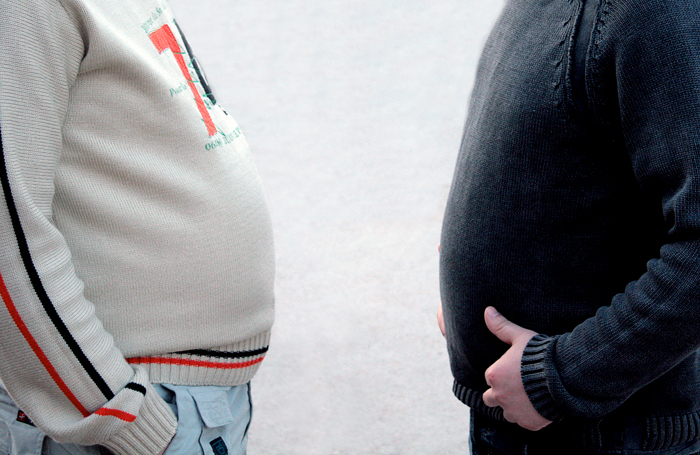 Stored fat converts to fuel easier and provides more energy (Calories) than protein. Fat is the real storage fuel for your body, not protein. So fear of loosing valuable quality proteins such as glands and muscle tissue because of a lowered intake of carbohydrate is only true when you don’t have any fat adipose tissue on you body frame. And you know Tim, who doesn’t have fat. I hope l simplified my answer and if you have more questions? Shoot them. Thanks. l was told by my trainer that Amino Acid supplements are not important for muscle building process. Is that true? If not what’s the effectiveness of Amino Acids and what’s the best time to take it? Thanks a lot. The body can not make them so that they must be taken from an external source. Methionine, Lysine, Threonine, Phenylalanine, and yes, Tryptophan. the body can not survive with a deficiency of any one of them. Leucine, Isoleucine, and Valine are commonly referred to as the branched chained amino acids and are of particular importance due to their ability to provide the body with about 70% of its nitrogen needs. Studies have shown that a shortage of branched chained amino acids, coupled with increased physical demands on the body, can lead to a cannibalization of muscle tissue to respond to the body’s need for nitrogen. Also amino acids not only form the building blocks of our voluntary, or skeletal, muscle tissue; such as the biceps, quadriceps, etc, but they also form the building blocks of our less ego oriented involuntary muscles, such as the heart. In addition to this muscle building function, each amino acid has a specific function in the body. These functions include among others in assisting in transporting long chain triglycerides, or dietary fat, into the cells for energy, stimulating the pituitary to secret growth hormone, which is involved in developing lean muscle tissue as well as mobilizing fatty acids from the adipose tissue (dropping body fat), supplying the body with nitrogen and much more. As previously mentioned that an obvious source of amino acids is from the dietary intake of protein. However, as we will now see there are some reasons that this source may not always be the most desirable. First, foods that are high in protein tend to, also, be high in fat. Second, as we age our level of digestive enzymes tends to decrease, thus impairing our ability to efficiently utilize proteins. At best, our digestive system are extremely inefficient. Third, for the athlete, meals that present an incomplete amino acid profile to our system will be of marginal use to the muscle building process. Therefore, a well balanced amino acid supplement can prove to be extremely cost effective for individuals desiring to maximize their protein intake at a minimal caloric cost. 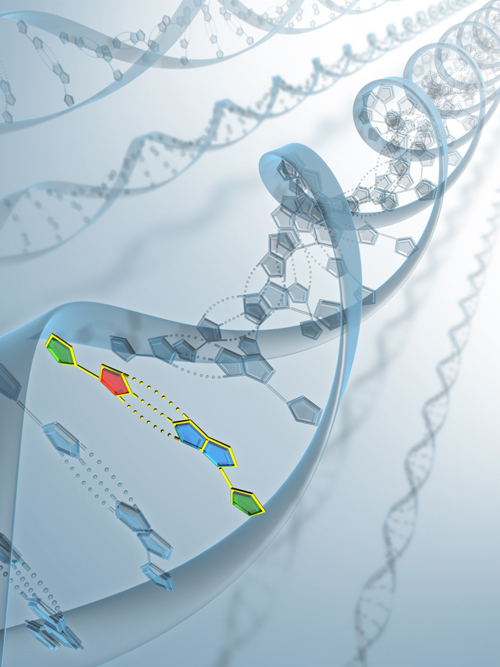 DNA uses amino acids to create protein and the body uses that protein to build muscle. The timing is important to achieve your success. By understanding the processes that ultimately lead these building blocks to the muscle cells it is possible to optimize their usage. At the center we always recommend that amino acids should be taken with meals. Did you say why? Because if we eat a meal that has an incomplete amino acid profile then the muscle building benefits will be considerably reduced. A quality amino acid supplement can help us to get more from our meals. Also the transport of amino acids from the bloodstream into the muscle cells appears to be regulated by the hormone, insulin. Due to the fact that our meals traditionally have some carbohydrate value, the corresponding insulin release will facilitate the increased utilization of the amino acids. The prior reasoning combined with considerable clinical experience has led us to utilize this administration approach that, while flying in the face of tradition “gym wisdom”, has led us to produce a considerable number of world class athletes like the two IFBB legends and my best friends Nasser AlSonbaty and Mike Mattarrazo. I hope l answered your question fully and completely Jeff. Welcome to the club Mark. I haven’t worked out or done any exercise for three months and l am paying the price with sleepless nights. We all know exercise is good for us. You lose weight, it’s good for your health, good for your waistlines, good for stress and for clarity of mind. And yes, exercise is also very — very —good for sleep. Exercise can improve sleep, especially for people with sleep disorders. And now there’s even more information about how regular physical activity can help with your sleep. There has been copious amounts of research conducted on the relationship between exercise and sleep. The results found that people who exercise regularly experience better quality and more consistent sleep than those who do not. People who exercise are also significantly less likely to feel sleepy during the day, and to experience symptoms of sleep disorders such as insomnia and obstructive sleep apnea. And the news gets better: While more vigorous exercise is best, people participating in light exercise — as little as 10 minutes of walking a day — reported substantially better sleep than non-exercisers. The National Science Foundation interviewed a nationally representative sample of 1,000 adults between the ages of 23 and 60. Participants were asked to report on their physical activity in the past week, providing details on the frequency, duration, and intensity of their exercise. They also were asked to report on the quantity and quality of their sleep, as well as sleep problems including symptoms of disordered sleep and daytime drowsiness. Participants provided information about their overall health, and personal habits including alcohol and smoking. Vigorous: These people participated in activities like running, biking, swimming, and other pursuits that require significant physical exertion. Moderate: Respondents in this category spent time doing activities that included higher-than-normal levels of physical exertion, including yoga and weight training. Light: People in this category were physical active at normal levels of exertion, getting their exercise primarily by walking. No activity: The respondents in this category did not engage in exercise. More than half of exercisers (56-67 percent) reported getting a good night’s sleep every night or almost every night, compared to 39 percent of non-exercisers. Exercisers at all levels also reported higher quality of sleep than non-exercisers. More than three-quarters (76-83 percent) said their sleep was “very good” or “fairly good,” compared to 56 percent of non-exercisers. More than half of exercisers at all levels also reported feeling their quality of sleep improve on days they engaged in physical activity. Twenty-six percent of vigorous exercisers said their quality of sleep was “very good,” compared to 16 percent of light exercisers. Sixty-six percent of vigorous exercisers said they got more sleep than they needed, compared to 53 percent of moderate and light exercisers. Vigorous exercisers had fewer sleep problems than moderate and light exercisers, including less difficulty falling asleep and staying asleep, waking too early and not being able to fall back asleep. All exercisers reported fewer of these problems than people who did not exercise at all. Fifty percent of vigorous exercisers said they had no problems maintaining enthusiasm for the demands of their daily lives, compared to 40 percent of moderate and light exercisers and 33 percent of non-exercisers. Non-exercisers were significantly more likely to say they experienced “very bad” sleep than exercisers. Fourteen percent of non-exercisers categorized their sleep as very bad, compared to 3-4 percent of exercisers. More than half — 61 percent — of non-exercisers reported “rarely” or “never” getting a good night’s sleep on workdays, compared to 29 percent of vigorous exercisers. Non-exercisers were more likely to feel sleepy during the day. Nearly twice as many non-exercisers reported daytime sleepiness as exercisers. Daytime sleepiness interfered with non-exercisers daily activities and their safety more often than for those who exercised. Fourteen percent of non-exercisers reported having trouble staying awake while driving, eating, or engaging in social activity one or more times in the previous two weeks, compared to 4-6 percent of exercisers. Non-exercisers were significantly more likely to have symptoms of sleep disorders, including obstructive sleep apnea. Forty-four percent of non-exercisers demonstrated a moderate risk for sleep apnea, based on standard clinical indications for the sleep disorder. This number was more than twice as high as for vigorous exercisers, only 19 percent of whom indicated a moderate risk of sleep apnea. The message here is clear: Put some time every day toward exercise, and when bedtime comes around you’ll sleep better. For those trying to juggle a regular exercise routine amid busy schedules, there’s some more good news in these researches. The results found that exercise at any time of day was good for sleep, including within four hours of bedtime. to avoid exercise during the final four hours of the waking day, in order to prevent physical exertion from interfering with sleep. Based on these results, l am revising my recommendation, and encourages normal sleepers to exercise at any time of day, provided that their exercise does not interfere with their sleep. People with insomnia and other sleep disorders should continue to schedule their exercise earlier in the day. And anyone who finds their sleep diminished by late-day exercise should do the same. So, to answer your question clearly. Start exercising, if you’re looking for ways to improve your sleep, your daily exercise routine is a great place to start. Also, sorry about your devastating divorce. In Arabic we say, “Tesbah Ala Kair.” Sweet Dreams. 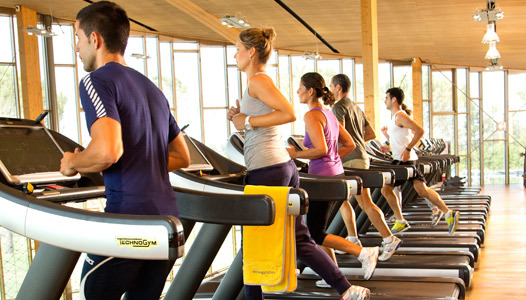 To help decide if you need to go to the gym, in your case gym membership is a waste of money. This doesn’t include the gym enthusiast who attends maybe five times a week for an hour or more and makes full use of all the facilities, including classes, saunas or any other extras offered. Enthusiastically, signs up to an expensive contract, with little or no chance of canceling it and attend regularly for a month but then never go again. Gym’s can be amazing on one hand but on the other they can be very expensive. Furthermore, if you try to get out of your contract you are likely to be hit with a hefty cancellation fee. 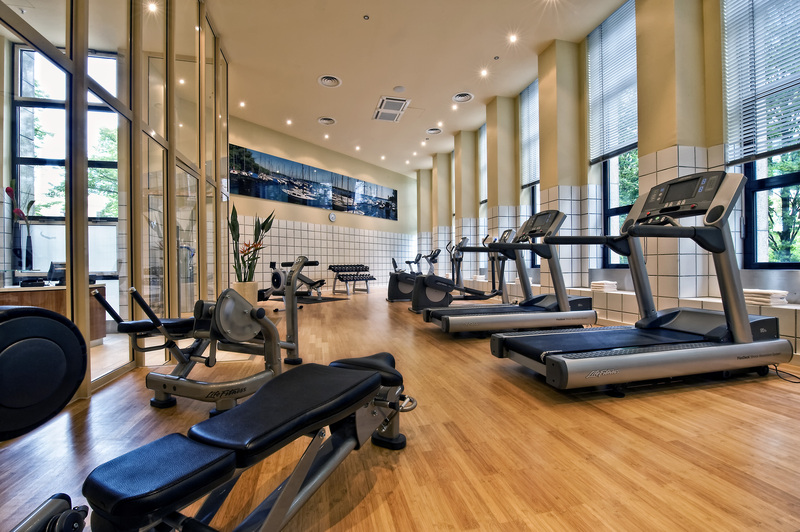 Gym contracts are notoriously unfair to the consumer some have been challenged in court. Believe me, I use to own a gym and it’s a business and this is how gyms make their money. They sign up as many people as possible, tie them into a contract and assume (probably quite accurately) that a sizable majority will not attend regularly, if at all. You have just handed a gym $1000 a year for nothing. In your situation just want to lose weight and lose your lower body fat, walking, jogging or running will be enough to do. The gym doesn’t apply to you. In order to achieve your ultimate goal, whether it’s muscle building or weight loss, you must adhere to the three pillars of health and fitness. 1-Diet, “Food Consumption.” 2-Exercise. 3-Supplementation. For some women, losing weight from the hips, buttocks and thighs is difficult. This challenge is even greater when you gain fat along these areas of the body first. While there’s no way to spot-reduce the hips, buttocks or thighs, you can lose inches by utilizing some of the more common methods of weight loss, particularly using the three pillars, diet, exercise and nutrition supplements. Fat accumulates in your midsection. You must create a calorie deficit if you want to lose body fat, what’s the best way to create this deficit? Should you decrease calories with your food consumption, increase physical activity, and gives it a push with supplementation. A calorie is a unit of energy, Specifically, calorie is the amount of energy it takes to raise the temperature of one kilogram of water one degree centigrade. The word calorie is used interchangeably to describe the amount of energy in food and the amount of energy stored in the body as adipose tissue (body fat). When it comes to calories and weight loss, if you burn more calories than you consume, your body will tap into stored body fat for energy to make up for the calories deficit and you”ll lose weight, If you consume more calories than you burn, your body will store the surplus calories as body fat and you”ll gain weight. Some foods may get stored as body fat more easily than others because of the way they affect your hormones or blood sugar, but too much of any food will get stored as body fat. A fat loss nutrition plan is based on cutting back on calories, not on drastically reducing them. It’s also based on you as an individual — your body type, your metabolism, and what mix of protein, carbohydrate and fat works best for you. A fat loss nutrition plan is not a temporary way of eating like a diet is, it’s a healthy way of eating that can be followed for a lifetime. A fat lose exercise routine that includes aerobic exercise enables you to lose body fat without losing lean muscle mass and without slowing down your metabolism. There are also plenty of health and fitness benefits associated with aerobic exercise. A very low calorie diet can produce quick weight loss, but what happens once the diet ends? Most people go back to the same old way of eating that caused them to be overweight in the first place and end up gaining back any lost weight. I lived it with my Palestinian mother. The reality is that very low calorie diets almost never result in permanent weight loss. Balance your diet with fruits, vegetables and whole grains, Eating these types of foods more the other types can help you feel fuller on fewer calories. This can help cut calories from your diet and generate the caloric deficit needed to lose weight, including the weight on your lower body. Limit the amount of food you put on your plate. This method of cutting calories from your diet allows you to continue eating some of your favorite foods, but just less of them. As with eating more fruits, vegetables and whole grains, this can help generate the deficit in calories needed to shed weight from the buttocks, hips and thighs. Watch your intake of both fat and sugar…Foods relatively hight in fat or sugar tend to be high in energy density, which means there’s often a significant amount of calories compared to the quality of food, leaving you less satiated than when you have eaten other food options. Running is great aerobic exercise. Incorporate aerobic activities into your day-today routine, particularly those pursuits that work the lower half of the body. Swimming, biking, jogging hiking, cross-country skiing and simply walking not only burn calories — which can help you reach the deficit to lose weight — but these activities also strengthen and tone the muscles of your legs and buttocks. This can provide you with shapelier legs and a more pert behind once you lose weight. Takes a deficit of 3,500 calories to lose 1lb. of fat. By reducing your caloric intake and increasing your level of physical activity, you can achieve the deficit. For example, reducing your level of caloric intake to provide a deficit of 500 calories a day, and then burning an additional 250 calories through exercise, can provide you with a weight loss of around 6 1/2 lbs. Also adding supplements to that will result to faster calorie deficit. The bottom line when it comes to calorie and weight loss is that there’s no better way to create a calorie deficit and lose body fat then by combining the three pillars, diet, exercise and nutritional supplements, The result will be not just leaner body but a healthier body. Lastly, if you’d like me to write you an actual 12 weeks plan including nutritional supplements email me at richiemishal@yahoo.com and l will send it to you right away. I hope l answered your question fully and completely. It’s really nice to see your question in my email box specially from Jordan, a country l cherish enormously. Getting back to your question. You probably wonder what you are doing differently from others around you at the gym? You workout several times a week. You try to eat relatively healthy. Yet that guy on the treadmill next to you always seems to be in much better shape. He doesn’t work out any harder than you. If you find yourself in this situation, it is a good possibility that you have fallen victim to one of the many deeply rooted misconceptions related to exercise and nutrition. Overtraining can have many negative effects. MISTAKE # 1: MORE TRAINING IS BETTER. After you get caught up in the flow of a regular workout schedule, it doesn’t take long until the positive effects begin to have an influence on your state of mind. Your energy levels rise, your self-esteem grows, and the muscle definition starts to become more noticeable as you look in the bathroom mirror, The satisfaction you gain from completing another successful workout can soon lead to addiction like behavior. Like any other addict, you increase the frequency. For the first few months. It was three days a week for thirty minute sessions. Now, you’re hitting the gym five times a week for two hours at a time. 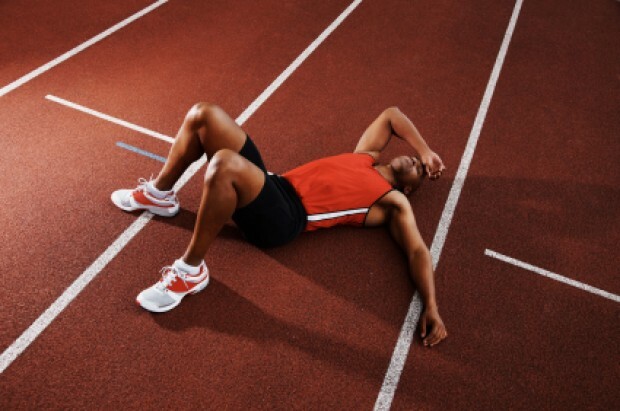 The common train of thought is, “if a little is good, a lot must be better.” Well, it is definitely possible for this train of thought to backfire and result in a condition called overtraining syndrome (OTS). In most cases the primary cause of OTS is inadequate rest and recovery. It is imperative that you give your muscles time to recover between workouts. Otherwise, you are beating your body down and it won’t be able to battle common, health stealing microbes and perform at it’s peak. If you might be suffering from this condition, the best think you can do is give your body time off from training (a few days should suffice). Rest is the only real cure for overtraining. Better yet, stop overtraining syndrome before it happens, be sure to give your muscles one full day of recovery after intense exercise. For example, if you work your biceps on Monday, don’t work them again until Wednesday. A poor diet will ruin your hard work at the gym. Many people under the assumption that since they work out multiple times a week, they are allowed to eat whatever they want because they are going to burn it off at the gym anyway. Sorry, but unfortunately it doesn’t work that way. While a steady amount of physical activity may be able to mask some of the effects of a poor diet, it won’t completely cancel out the excessive fat and calories. Most people don’t realize how easy it is to consume 1,000 calories, and how difficult it is to burn that same number of calories off. A thousand calories sound a lot… and it is. Consuming this amount of energy from nothing but fruits, vegetables, whole grains, and other healthy snacks would take a large amount of food, but with the temptation of fast food restaurants now everywhere in Amman, high calorie packaged goods, and overwhelming portion sizes, taking in 1,000 calorie in a single meal is much easier than you think. For instance, l am sure you know the Big Mac and a medium fries from McDonald’s, stacks up 1,040 calories, and that doesn’t even include a beverage. The truth is that many people aren’t aware of the amount of calories that they are ingesting. We need to become better educated about the calorie content of our favorite foods. Let’s take some common activities as examples. Riding a stationary bike is a popular cardiovascular exercise, and at a moderate pace it would take nearly tow hours for a 175 pound person to burn 1,000 calories. A tad bit more than the standard thirty minutes you usually spend riding the bike at your local gym, right? At a 10-minute mile pace, a 200 pound individual would need to maintain that rate for an hour to cancel out 1,000 calories, a difficult task for someone who is not in the best of shape. As you see, burning 1,000 calories isn’t exactly a walk in the park, literally. It takes a considerable amount of effort. And, if you consume 1,000 calories over what you body needs to maintain a healthy weight, you will need to put forth that much more effort to rid of the extra baggage. Two athletes talking while they recover after exercise. MISTAKE # 3: YOU GROW WHILE YOU ARE WORKING OUT. When does muscle growth occur? If you said during workout, you’re wrong! While performing the exercise, you are actually tearing and breaking down your muscles, making them weaker. The muscle grow and increase in strength occurs during the rest period. Therefore, if you don’t allow enough time to recover, you are running the risk of developing OTS and severely limiting your body potential for growth. You can spend two hours at the gym day in and day out, but if you aren’t letting your muscles fully recover between sessions, then all of that hard work will do more harm than good. A more effective plan would be to cut down the amount of time you spend at the gym, and reinvest that time into eating healthy meals and getting quality sleep. Wouldn’t you rather build muscle eating or sleeping than spend another hour at the gym anyway? Don’t get me wrong. The work you put in at the gym is important, but rest and recovery is just as valuable. To make most out of your time in between trips to the gym, you should be consuming meals rich in protein and complex carbohydrates and low in fat and processed carbohydrates. “These products can be found at, http://www.usadiamondnutrition.com.” In addition, aim for at least seven hours sleep each night. If for one reason or another you weren’t able to get a full seven hours, try to sneak in a short nap during the day. MISTAKE # 4: DRASTICALLY REDUCING CALORIES WILL CAUSE ME TO LOSE WEIGHT FASTER. This misconception is probably the most common of all. When it comes time to lose weight, the first step that pops into your mind is to keep calories intake to an absolute minimum. If you want to drop some weight, this is not the way to go. The human body is a complex system and unfortunately it will take a little more effort to outsmart it and drop that excess weight. After drastically reducing caloric intake, the body senses that it isn’t receiving an adequate amount of energy and nutrients. In response to the significant nutritional cutback, the body slows down its metabolism to conserve the food that it is receiving. For this reason, many individuals are still unsuccessful in their attempts to lose weight. Worse yet, you can lose highly metabolic lean muscle from doing this! A better approach would be to gradually reduce calories over an extended period of time. The dietary adjustment won’t be as drastic; therefore the body won’t produce the same reaction. If you have been working out on a steady basis and trying to keep a close eye on what you eat, but you still can’t achieve the physical appearance you desire, then take a careful look at your lifestyle to see if you are committing one of these common mistakes. One (or more) could be all that is standing in the way of gaining a firm grasp on your fitness goals. Lastly, l am shooting for May, 2013 to visit Jordan. Hope that l answered your question fully and completely.